El Morro is about a mile away from San Cristobal. 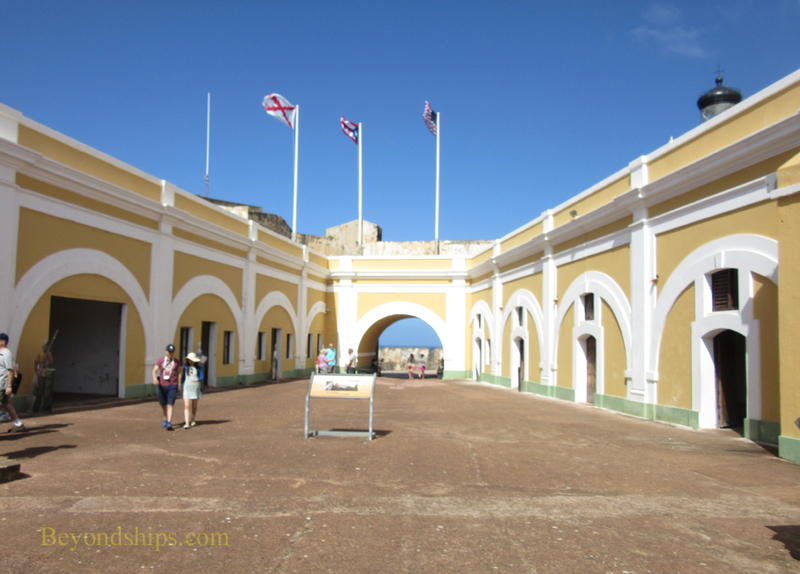 Leaving by the Historic Entrance, you can just follow Calle Norzagaray westwards towards El Morro. Again, the free trolley is an alternative. 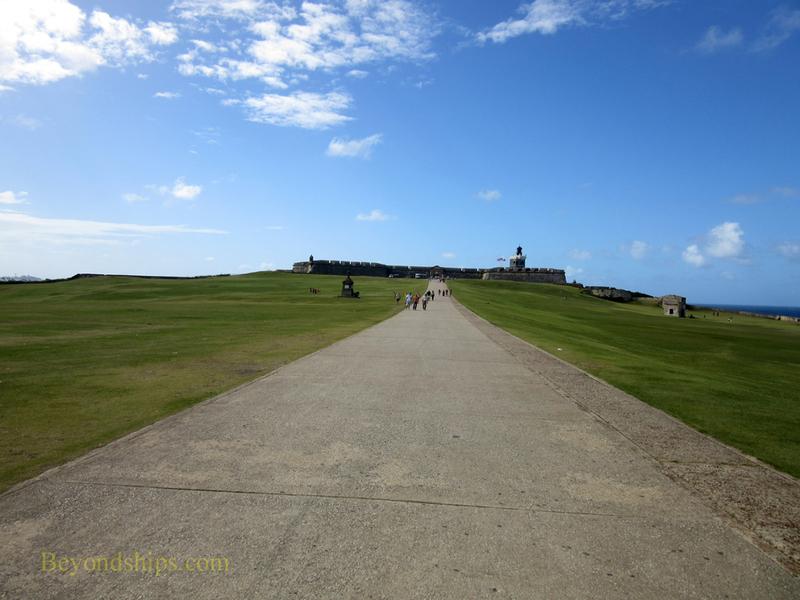 In front of El Morro is a vast green space running a quarter mile from Calle Norzagaray to the main gate of the fort. The original purpose of this space was to give El Morro's defenders an unobstructed field of fire at anyone who might be attacking from the landward side. When El Morro was a U.S. military base, trees were planted and the remainder of this area was converted into parking lots, baseball diamonds and even a golf course. In 1992, the Park Service returned the area to its original state. Today, locals come here to relax on the green lawn. Kite flying is also popular. 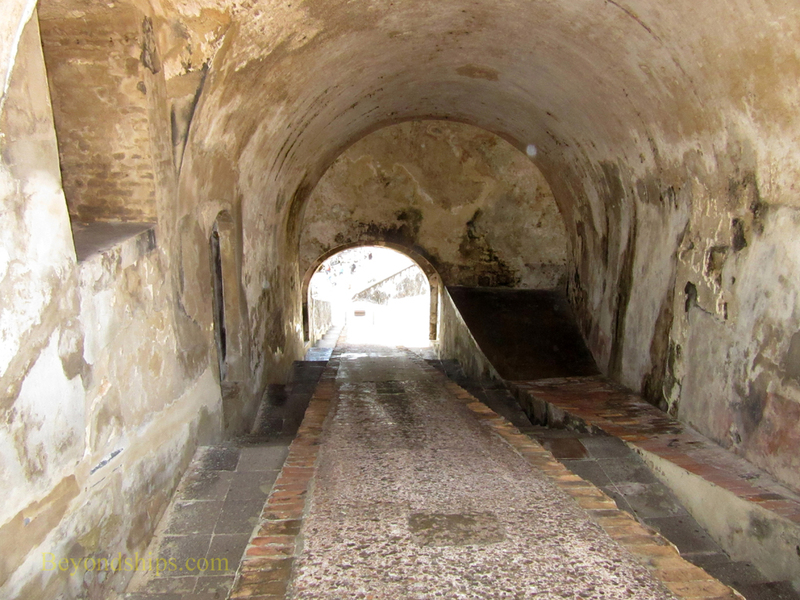 In many ways, El Morro and San Cristobal are similar. Both were designed as cannon platforms and their main periods of construction overlap. 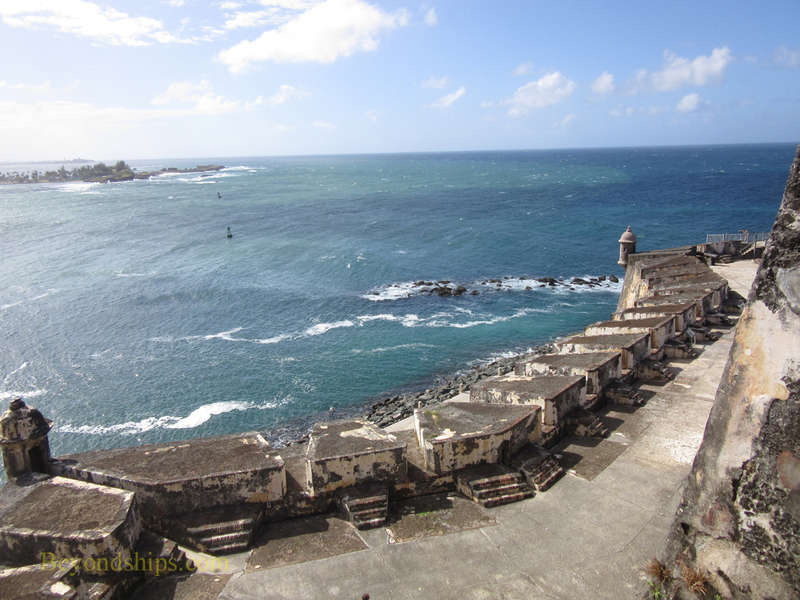 However, due to its location perched alone at the western tip of the islet atop towering cliffs with the sea on two sides, El Morro is the more spectacular. Painted in ocher with white trim, the main plaza of El Morro also has a more lively feel than its counterpart at San Cristobal. Inside the rooms surrounding the plaza are recreations of the chapel, barracks rooms and exhibits that include some ancient artillery. As at San Cristobal, park rangers give orientation tours during the course of the day. These depart from the main plaza. There is also an introductory movie and signs around the fort explaining various features and putting them in context. El Morro is on six levels. A rather steep combination staircase and ramp runs from the main plaza down to the water battery, the lowest level. Guns were placed here to protect the narrow entrance to the harbor. Ships attempting to pass here would be caught in a crossfire with El Canuelo, a much smaller fortress on the other side of the entrance. The defenses and the living quarters down here are pretty much empty. However, from here you do get a dramatic perspective looking back up at the rest of the fortress. Along the same lines, it is a thrilling sight when a large ship is passing. Built in 1539, Torre Antiqua is the oldest part of the fortress and has withstood the rigors of time. Indeed, a fragment of a shell from the 1898 duel with the U.S. Navy remains lodged in it. 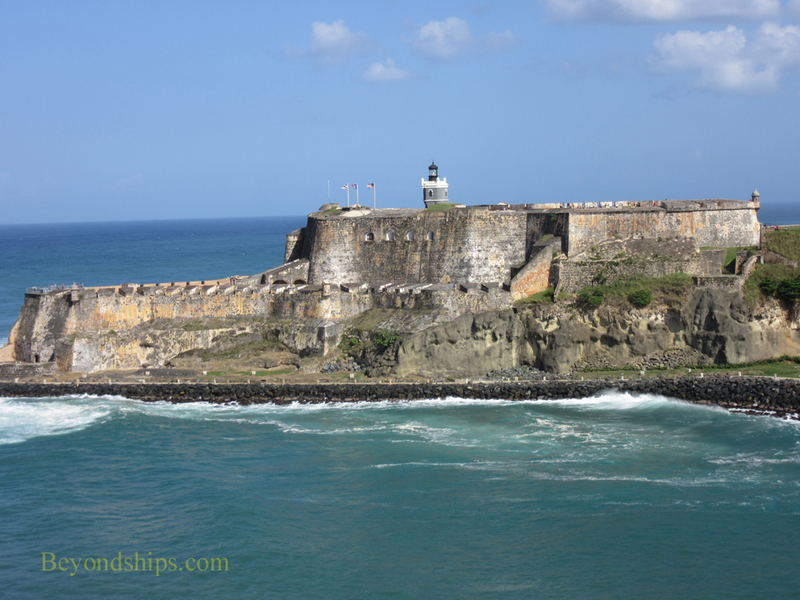 One feature that El Morro has that San Cristobal does not is a lighthouse. 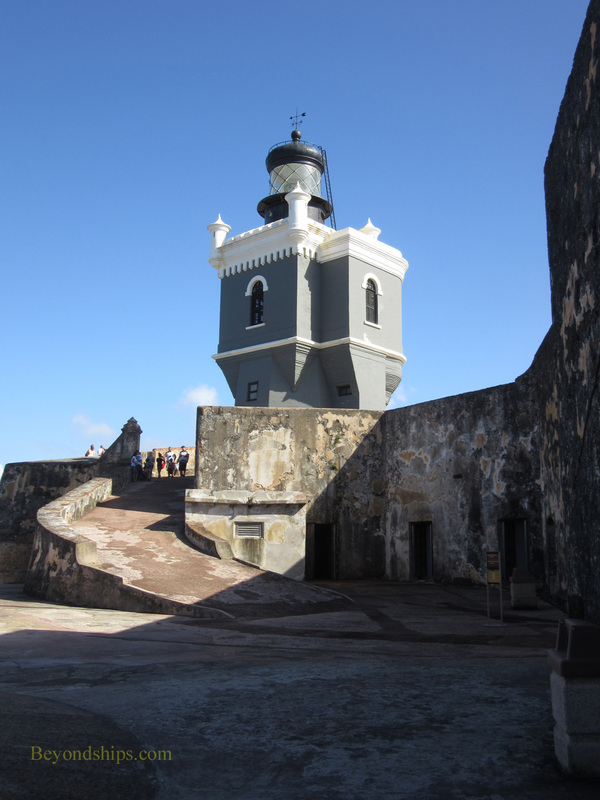 The first El Morro lighthouse was built by the Spanish in 1846. A few years later it was moved to a slightly different location within the fort so as to be more visible from the sea. That lighthouse was destroyed during the duel with the U.S. Navy during the Spanish American War. It was rebuilt in 1899 but the current one dates from 1908. It sits atop a square tower and is still used as an aide to navigation. The tower is gray because, as you might expect, that is the color the Navy had on hand when it was built. The Park Service gives a free tour of the lighthouse once a month. At both El Morro and San Cristobal there are remnants of World War II defensive structures interspersed with the colonial era structures. It might seem strange that the U.S. built such structures on Puerto Rico considering that the island is so far away from the battlefields of Europe and the Pacific. However,it should be recalled that in the early years of the war, the German pocket battleship Graf Spee made a foray into the Caribbean. More importantly, German U-boats found plentiful targets in the Caribbean and one even made an attack (unsuccessful) on the oil refineries on Aruba. Thus, just as the threat of sea raiders required the Spanish to build defenses in the 17th century, the same threat required modern defenses in the 20th century. In the end, visiting El Moro and San Cristobal are a rewarding experience. Their histories stretch back hundreds of years. Perhaps more importantly, there is the atmosphere. Their 18 foot thick walls towering more than 145 feet above the surroundings convey power. In addition, they speak of a seemingly more romantic time of exploration and pirates. That all may be illusory but it is nice to dream occasionally. In any event, the views are real and they are spectacular. 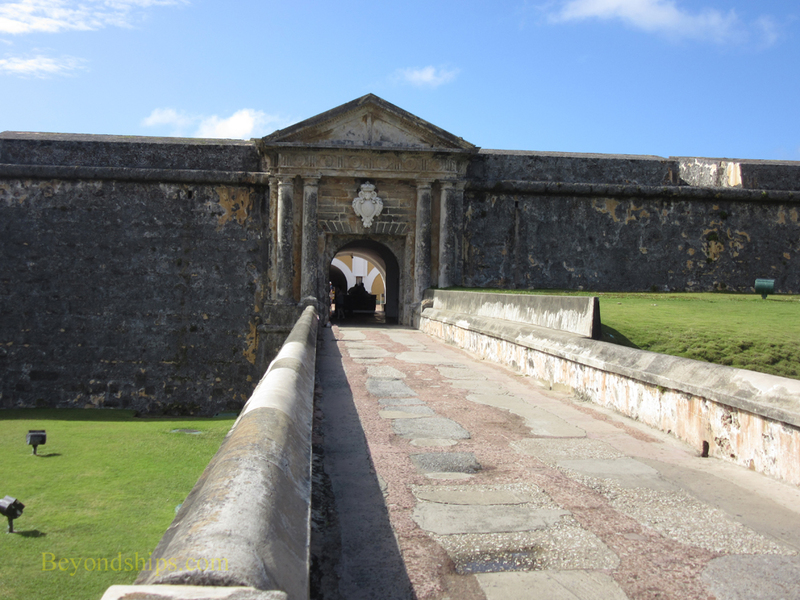 Above: The entrance to El Morro is about a quarter mile from the road across a vast esplanade. Above: The ramp/stairs leading from the main plaza to the lower battery.